Get predictable, consistent colours print to print, day by day, across all HP Designjet Z series Photo printers thanks to precise advanced colour calibration. Save time and money with advanced HP’s preview technologies which help eliminate trial and error: simply preview layout, size and position of your print on your paper. Print rich, dark blacks without wasting ink and money swapping ink cartridges. The 8 Original HP Photo Inks cartridges within this Designjet contain three-black inks: matte black, photo black and light grey. The HP Color Center tool guides you through colour management and printing. Choose from the wide variety of HP photographic, fine-art and proofing media or boost your creativity with specialty papers from other vendors such as Hahnemühle. Get colour accuracy on any paper: HP’s first-ever embedded spectrophotometer enables the printer to generate custom ICC profiles for your preferred paper, simply and automatically, in under 20 minutes. Grab a used HP Designjet Z2100 for only £495! For rich, durable colour prints at an affordable price, look no further than the HP DesignJet Z2100 Photo Printer. You get brilliant colour that lasts up to 200 years. 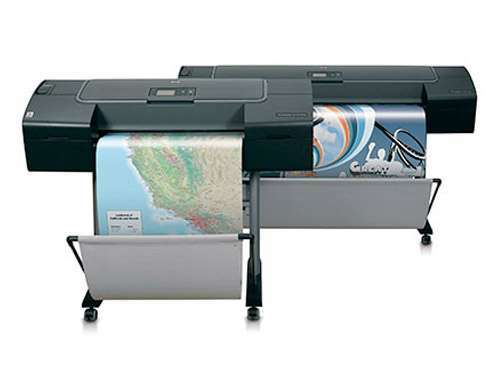 Included HP utilities provide hassle-free printing, maintenance, and color management. The HP DesignJet Z2100 Photo Printer helps you achieve effortless colour calibration and profiling. The embedded spectrophotometer lets you generate custom ICC profiles for colour accuracy and consistency.